Class 66 66220, newly outshopped in D B Schenker Rail Polska colours, at Zdzieszowice en route to Czempin and Srem on 16 June 2011. Photo J. Stawinski. After the completion of extensive homologation tests, D B Schenker Rail Polska have commissioned their Class 66 locomotive 66220. The loco, which has generated a great deal of interest in Polish railway enthusiast circles, formerly worked in the UK as part of the EWS motive power fleet. Class 66 66220, at Srem station on 17 June about to return to Czempin and the main line. Photo J. Stawinski. On 16 June, 66220 worked a train of 30 bogie coal wagons down the SKPL-operated Czempin – Srem branch. 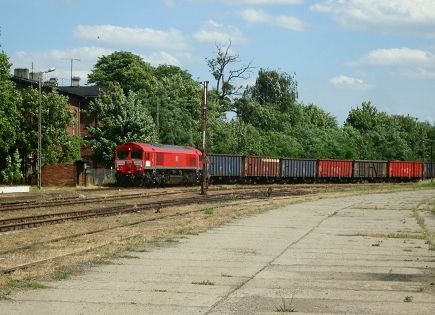 After delivering its load to the foundry at Srem, 66220 spent the night there and returned with the empties on 17 June. Class 66 66220 and 30 empty coal wagons, at the boundary of the Srem District on 17 June. Photo Albert Mikolajczyk, SKPL. SKPL 401Da-216 0-6-0D shunter backs on its train at Czempin on 11 June 2011. Photo Albert Mikolajczyk, SKPL. Saturday 11 June saw passenger services returning for one day to the Czempin – Srem line on the occasion of the Dni Srema festival. The train consisted of two, 2-coach articulated double-decker sets painted in heritage dark olive green. Photo Albert Mikolajczyk, SKPL. 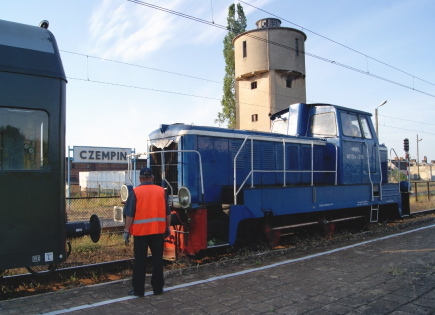 The one-day operation was a joint between Przewozy Regionalne – who provided the rolling stock – and SKPL – who provided the locomotive and driver. The line runs mostly along the main road although – as above – there are some very attractive scenic sections. Photo Albert Mikolajczyk, SKPL. The day’s operation received financial support from Srem Town Council. This rural scene level crossing usually only sees a daily freight train. Photo Albert Mikolajczyk, SKPL. SKPL ran 4 trains each way between Czempin and Srem. 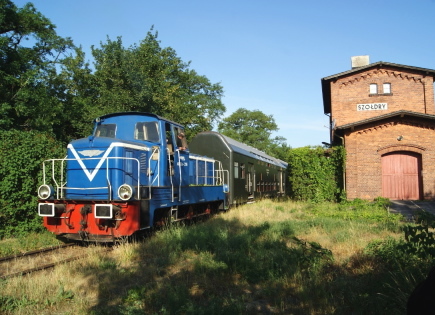 SKPL 401Da-216 and train run literally through the station master’s garden at Szoldry. Photo Albert Mikolajczyk, SKPL. The first train left Czempin at 07:35 and included a number of stops to allow railway enthusiasts to take pictures. The semaphore signals are still in situ at Grabianowo, although they have been unused since PKP suspended services on the line. Photo Albert Mikolajczyk, SKPL. Electronic destination board on a coach making up part of the Jan Kiepura train in March 2011. Photo BTWT. Until now the shortage of passenger coaches ‘in ticket’ has been inconveniencing PKP Intercity’s domestic passengers, but now IC’s troubles are now seriously effecting IC’s international trains. Advance booking facilities have been withdrawn for journeys after 24 July on the BWE 40, 42, 44 and 46 trains running between Warsaw and Berlin and the prestigious EN 436 Jan Kiepura service between Warsaw and Amsterdam. In addition advance booking facilities have been withdrawn for journeys after 31 July on trains to Austria (EC 103 Polonia Warsaw – Villach; EC 105 Sobieski Warsaw – Vienna). A similar fate has fallen on passengers intending to travel to the Czech Republic, Hungary and Bulgaria (EC 110 Praha Warsaw – Prague / Budapest; 407 Chopin Warsaw – Vienna / Budapest / Prague / Burgas). In addition there will be no advance booking facility on 23 July on EC 248 Wawel running between Krakow and Berlin and on 24 July running between Krakow and Lueneberg. Finally between 4 – 29 July trains 35/36 Krakow – Lwow – Krakow have been suspended altogether. If PKP IC is prepared to treat its international passengers in such a cavalier fashion one seriously doubts the wisdom of the Polish government backing its planned €665 million purchase of the Pendolino train sets. Pm36-2 pacific, Piekna Helena at Kolobrzeg on 29 May 2011. Photo WOT. The Summer steam railtour season has started in earnest. The Children’s Day Pirat special from Poznan to Kolobrzeg was a ‘sellout’ which was hardly surprising – the trip was subsided by the office of the Chief Executive of Wielkopolska province and tickets were only 76 zloty return. As in previous years, the special did not stop at Kolobrzeg station but continued along the siding through the town to the dockside. Poznan Glowny – Poznan Garbary – Poznan Franowo – Sroda Wielkopolska – Jarocin – KoZmin Wielkopolski – Krotoszyn – Krobia – Leszno – Koscian – Poznan Glowny. Poznan Glowny – Oborniki – Pila – Okonek – Szczecinek – Kepice – Slupsk – Ustka – Slupsk – Kępice – Szczecinek – Okonek – Pila – Oborniki – Poznan Glowny. Poznan Glowny – Rogozno Wlkp. – Chodziez – Pila Gl. – Krajenka – Zlotow – Zakrzewo – Zlotow – Krajenka – Pola Gl. – Chodziez – Rogozno Wlp. – Poznan Glowny. Poznan Glowny – Poznan Staroleka – Poznan Franowo – Oborniki – Rogozno Wlkp – Pila Glowna – Bialosliwie – Naklo nad Notecią – Kcynia – Damaslawek – Gniezno Winary – Gniezno – Poznan Garbary – Poznan Glowny. Poznan Glowny – Buk – Opalenica – Nowy Tomysl – Zbaszynek – Miedzychod – Sierakow – Miedzychod – Zbąszynek – Nowy Tomysl – Opalenica – Buk – Poznan Glowny. Poznan Glowny – Lubon k.Poznania – Koscian – Leszno – Jaworzyna Slaska – Walbrzych – Jedlina Zdroj – Klodzko Glowne – Wroclaw Glowny – Leszno – Koscian – Lubon k.Poznania – Poznan Glowny. Piekna Helena taking a walk in the park on the way to the port in Kolbrzeg. Video by Pento2. Piekna Helena negotiating its way through the crowds by the quayside. Video by Pento2. 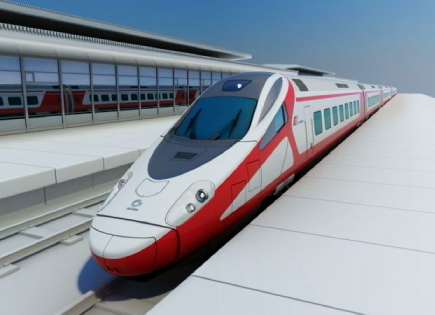 New Pendolino in Polish colours – Alstom visualisation. It’s worth remembering that we’ve been here before. Polish railways already once bought Pendolino. In July 1998 – after a tender had been evaluated – 16 trainsets were ordered. An agreement was signed and a great success was trumpeted. But the rejoicing was short-lived, after a National Audit Office (NIK) investigation, the tender was annulled in December 1999 and no trainsets were ever delivered. What links both these situations is the financial standing of the purchaser. Just as 13 years ago, the railway has not managed to complete the financing package for the the modern rolling stock. To avoid history repeating itself, the Government has offered PKP InterCity a 10 year contract for the operation of long distance trains. So far approval for this deal has not been obtained from the European Commission. And it is by no means certain that approval will be granted, because when Spain was in a similar situation the subsidy was rejected. The crowning argument was that such services could be run commercially and that there was no reason to disturb the operation of free competition in the transport market. So just before the expiry of Alstom’s offer the Government has stepped in to guarantee the required credit. An agreement has been signed with the proviso that PKP IC has another three months to complete the finance package and make its final decision. The financial barrier has led to another strange situation. In an effort to make savings PKP has bought a tilting body train that won’t tilt. This has allowed the price to be reduced at the cost of reducing the trains speed on lines with many curves. And this gives rise to another question – if we are basically buying a classical technology train which can only travel a tad faster, maybe it would have been better to have specified the operating speed at 160 km/h (100 mph) and to have bought three times as much rolling stock. Such rolling stock would have been appropriate for our generally level country and the track upgrading being carried out by PKP. It would also have been cheaper to maintain. An investment in tilting body technology means shorter journey times and greater comfort. Purchasing classical technology trainsets means a larger pool of rolling stock, more capacity, more frequent trains and a larger network of connections. Unfortunately the chosen option manages to miss both objectives. In an interview with Rynek Kolejowy Andrzej Massel, the Undersecretary of State at Poland’s Ministry of Infrastructure responsible for Poland’s railways, hit back at the critics. I’m really surprised at all the critical comments that were published in the Polish media. I’m sad because what is being criticised is a clear success, an important step in the modernisation of the Polish railway. This really is rolling stock from the top shelf rolling stock that conforms to the technical interoperability standards for high speed trains. It is capable of operating at 250 km/h. Here in Poland it will run at 220-230 km/h on the CMK.That is why we are spending money on this line to permit higher speed running. Thanks to this between Warsaw and Krakow or Katowice we will be able to offer a very high standard of service. Comparing the Pendolino with conventional rolling stock is a grave mistake – there’s a huge difference, that’s why it guarantees a different standard of travel and different speeds. Of course acquiring such rolling stock makes greater demands, however we must take this first . If our dreams about high speed rail travel are to be realised, we have to take the first step, we have to learn about high speed railways. The CMK – where over the last few years we have invested a fair amount money and installed ECTS Level 1 will be our learning laboratory. This new rolling stock will allow us to fully exploit our investment. We also need it it for the Warsaw – Gdansk, Gdynia, Sopot line where it will be able to travel faster than present day services. I’m pleased with this transaction. I’m aware that there are those who think that we should have purchased rolling stock of a lower standard, for different routes. However, I believe that that we should look at the transaction this way – there is a complementary between infrastructure and rolling stock. The infrastructure improvements between Krakow to Gdansk, Gdynia, Sopot by way of Warsaw are proceeding very sucessfully. This rolling stock will allow us to exploit these investments from 2014. At the same time it will be an important signal for the public that we really have a high speed railway. The next step will be the construction of the “Y” line linking Poznan and Wroclaw through Lodz to Warsaw. but tilting trains won’t tilt! Latest generation tilting train, the New Pendolino ETR 600. From a photo by Mathew Black in Wikimedia Commons. PKP Intercity, has awarded Alstom a contract to supply 20 New Pendolino trains, their full maintenance up to 17 years and the construction of a new maintenance depot. The first trains are scheduled for delivery in 2014. The 7-car train sets will cost €20 million each. Alstom will also supply full maintenance of the trains up to 17 years in a new depot of 12.000 m² which will be built in Warsaw. The maintenance package will bring the total cost of the contract to €665 million. PKP SA, the holding company responsible for all the PKP daughter companies, originally hoped to attract an EU grant for the purchase of the high speed trains. Indeed the feasibility study for the EU finance assisted Warsaw – Gdansk track upgrading specifically required that the upgrading be compatible with the introduction of tilting train technology. However, the German railway industry lobbied hard against PKP acquiring the Pendalinos and receiving any EU assistance. In the end Alstom has agreed to give PKP IC another three months to complete its funding package. PKP IC will operate the trains on existing routes in Poland: Warsaw – Gdansk – Gdynia; Warsaw – Krakow; Warsaw – Katowice. The train sets will be able to carry up to 402 passengers and have a maximum speed of 250 km/h. In practice, given the state of Poland’s railway infrastructure, it is unlikely that the trains will operate anywhere above 200 km/h (125 mph) and they will only operate at 200km on a short section of the 1970s built CMK between Warsaw and Krakow. For the rest the trains will be throttled down to 160 km/h (100 mph) or less. Pendolino’s tilting train technology would have been ideal on the sharply curved section of the Warsaw – Gdynia line on the section Dzialdowo – Ilawa – Malbork. There just one problem – PKP IC has chosen to buy the Pendalino trains without the tilting mechanism!